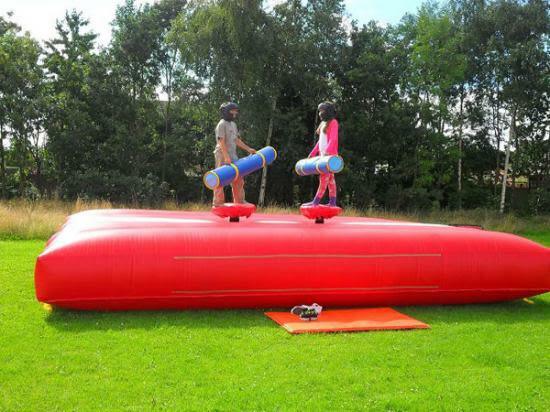 Introducing the Gladiator Duel - an inflatable feature that can transform your average party into the event of the year. Battle friends and family members atop the platform for gladiator supremacy! Have fun trying to knock each other off the podiums to land safely on the bouncy platform. Then, fall down, get up, and try again! This game can be so much fun for hours on end - and it’s perfectly safe! There isn’t an age too old for this game. Whether you’re a small kid or simply a kid at heart, you can enjoy fighting in this inflated arena. It’s the best centre attraction for any kind of party, whatever the occasion might be. See the queue for game participants pile up in a matter of minutes - everybody will surely want to get in on the action! The Gladiator Duel is available for just £65 for the day! Add an extra £15, and you can keep playing with it overnight! This is ideal for outdoor use - have it on your lawn, garden, or poolside! For more information about booking, corporate orders, or other concerns, fill out our Contact form and our friendly representatives will get back to you promptly. See you at your next event!